The history of beads begins over 40,000 years ago and evidence of their existence has been found in many ancient cultures and civilizations. They have been used not only for making jewelry, but also as currency, and as religious symbols for use during prayer. In the ancient past, it is thought that beads held some kind of important symbolic meaning in certain cultures, not only because of the intricacy of the beads themselves, but because of the amount of time and effort that went into creating them. An interesting fact is that almost two thirds of the Earth’s population uses beads as part of their religious practice during prayer. Some scholars have a theory that this development naturally evolved from the use of the abacus, a framed counting tool that uses beads that served as the main calculating tool before the written modern numeral system was in use. Beads have quite a long and interesting history, and are made from a variety of materials. The ancient Sungars from Sungir, Russia spent many hours just to craft one bead. Without modern tools and equipment, over 29,000 years ago, this culture spent approximately one to three hours of crafting time per bead. This was a culture that faced many challenging circumstances and had to struggle to simply keep fed and warm. In three graves that were found from this ancient culture, a total of 13,000 beads were found divided among the graves of one adult male and two children. This means that around five years worth of time combined went into creating these beads, leading us to believe that these people were held in extremely high regard in this culture. 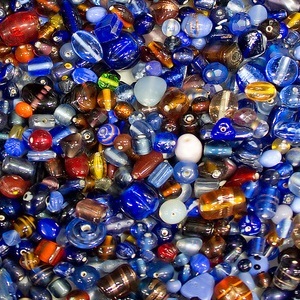 Glass beads have been being produced as far back as 5,000 years ago. The essential ingredient in glass bead making, besides glass, is fire. In Mesopotamia, dating back to 2340 to 2180 BC, there is evidence that the people were making glass beads through a method of holding glass over a flame while holding onto a metal mandrel. As the glass began to soften they would wrap it around the mandrel to create the bead. Their primitive method of glass bead making is referred to as core-forming. Venetian bead making can be traced back to the days of the explorer Marco Polo’s travels. When he one day returned from Asia with some beads he had acquired there, local artisans began to seek ways to reproduce the beautiful glass beads themselves. In the 1920s and 1930s, the art of bead making provided employment for many women in Venice while their husbands were off serving in the war. In these bead factories, they created such designs as the seedbead, Rosetta, Venetian blown beads, and lampwork beads. In Kenya, at a site known as Twilight Cave, beads made from ostrich eggshells were uncovered during an excavation. These findings are thought to be around 40,000 years old. It is thought that not only could these beads have been made as early types of jewelry, but perhaps also used as tokens or gifts in rituals, making them a very early example of symbolism. Beads and beading work that date back to 3,200 B.C. have been found in the ancient Egyptian culture. It is thought that they saw beads as a token to bring good luck. The Native American culture uses their handcrafted beading as a way to honor their spiritual ancestors. African cultures used beads as a form of communication and during rituals, as they were thought to help evoke the power of the gods in their religion. In the Hindu religion, beads are used for purposes of repeating mantras and used during prayer for counting breaths. The Buddhists believe that beads will help them to attain enlightenment, and in Islam,they are used in religious practices to praise Allah. For the Maasai culture in Africa, beads play a significant role. For example, this culture practices arranged marriages. When a couple is selected by the parents, the mother of the bride will begin working on two important items. She will make for her daughter a necklace of beaded strings to represent that her daughter is now engaged. This is known as the engagement necklace and differs from everyday beaded necklaces. On the engagement necklaces, the strings are intertwined to signify their connection as a couple. The mother of the bride to be will also make her daughter a bridal collar, which is a flat, large circle of leather that measures about 12 inches across. This collar will then be adorned with colorful geometric shapes made from beads. On the front of the collar, there is a square section that sticks out a bit which will feature long, hanging beaded strings with cowry shells attached to the end. Every detail of this bridal color is made to represent something significant in the bride’s community and cultural traditions. Many cultures around the world have given much meaning and purpose to how they use beads. They can be used spiritually, ceremonially,or as a means of celebration in various religious customs. In some cultures they are incorporated and used in healing rituals. Beads and beading may also represent status and be seen as a symbol of wealth and power. Beads are crafted from a variety of different materials, and the ancestors of the past came up with some very interesting ideas to use in beadmaking. They used items such as pebbles, clay, teeth, claws, and shells. The invention of glass over 5,000 years ago paved the way for new ways of creating beautiful glass beads. Glass beads date as far back as the Mediterranean, Egyptian, and Venetian cultures, and were also made during the Roman Empire. Beaded jewelry can also be crafted using materials such as colorful gemstones, or metals such as copper, gold, or silver. As you can clearly see, beads represent much more than just a colorful decoration in many different cultures all over the world. They have a significant role in many religions, and tend to be worn by those in high authority in some cultures. From simple to elegant, beads can be found in everything from a child’s jewelry making kit, to the most intricate and elaborate items from ancient times. While beads have always been colorful and fun, knowing the true meaning behind some of them can give a person new appreciation for beads and the art of beading. If you are looking for ideas or inspiration for your beading projects, check on these tutorials and projects here.